Bring down the beast that’s been terrorising Symko and earn a hefty reward. You’ll pick this Contract up at the Oxenfurt noticeboard, then head over to the Crows Perch signpost and go north into town. Talk to Chet who will tell you about the Shrieker, then go around the back of his house to meet with Symko. He’s scared, but if you use your sign on him he’ll calm down and you’ll pick up 25 EXP. 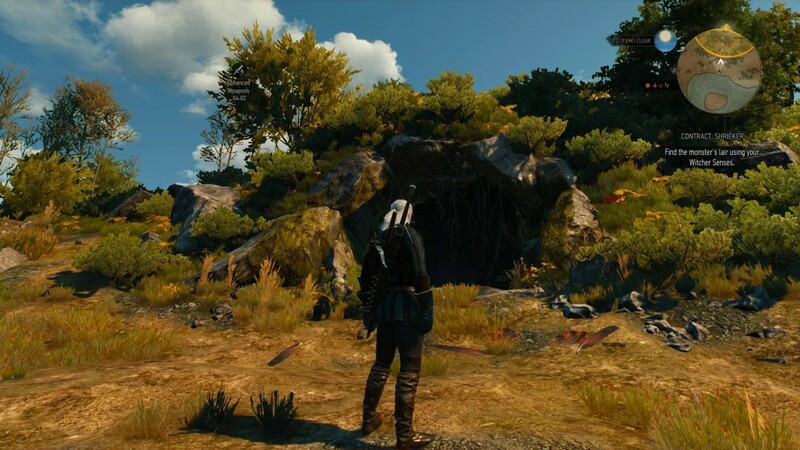 Head over to the search area and use your Witcher senses. You’ll find a dead goat and monster blood, which you should follow up on to the hillock and past the burned house, and over the others side to the Cockatrice’s cave entrance. As you enter the cave you’ll hear the beast but you won’t be able to see it. You’re going to need to smoke it out with either a Samum, Grapeshot or Dancing Star bomb. Samum is something you should have made very early in the game so you’re likely to have one in your supplies. If not, you only need basic ingredients of Celandine and Saltpeter, both of which can be bought from any Herbalist. Celandine in particular grows around a lot of green farmland and anywhere cattle are grazing. Inside the cave look up at the ledge and toss your bomb of choice. The Cockatrice will screech and fly off through a different exit. Outside you’ll need to whistle Roach and follow the creature until it’s ready to swoop back and fight you in the open. Firstly, Igni is a good sign to use here, despite the bestiary stating that Aard is its real weakness. You can also use Draconid Oil and Grapeshot to good effect. Burn it with Igni or use Aard to stun it when it gets close and then follow up with some swift attacks before rolling away. Whenever it flies off be prepared to roll out of the way as it dives back down. On the ground the Cockatrice swings its claws and has a long reach. It also hovers before stomping down so make sure you use the open field to stay mobile. The Cockatrice circles you and will draw its wing back before lashing out – if you see this roll away. If it hits you, you will take bleeding damage for around 10 seconds so you really need to stay away from the claws. If you’re a particularly low level character an easy way to kill this beast is to use Igni only and keep rolling away until the sign has regenerated. It’s cheap but it works at a push. 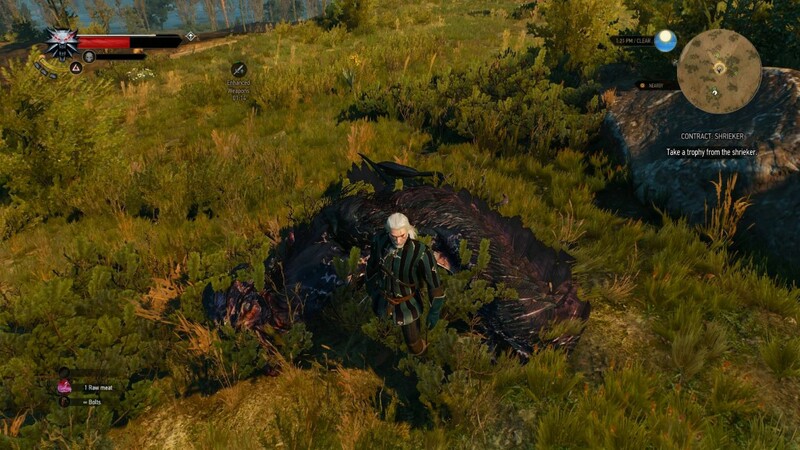 Once dead loot the corpse for the Cockatrice stomach, egg, mutagen and more, then head back to Chet for 235 EXP and a load of crowns (which you can decline for him to give to his son).